Swatches: OPI over black, Barry M over black, OPI over white, Barry M over white, OPI alone, Barry M alone. It's not often I come across a dupe in my nail polish collection as I'm quite careful with the colours I buy. Especially when it comes to glitters as well. When I was organising my collection into colour families I found this dupe and thought I'd share it. If you've been thinking of buying OPI's Pink Yet Lavender from the new Mariah Carey collection and you're from the UK then hold on. You can buy Barry M's Rose Quartz for only £2.99. Not only is it much easier to find, it's about a quarter of the price and I can't tell a difference between the two. 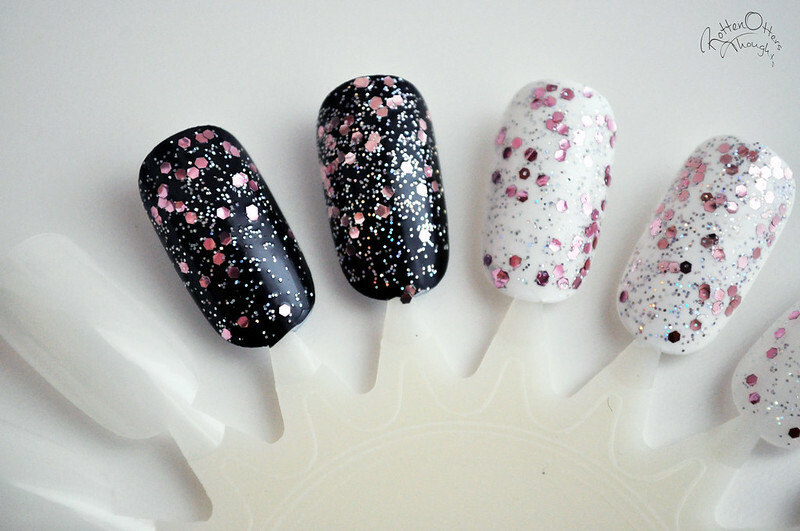 They both contain large pink hexagonal glitter and small holographic glitter. They do look slightly different in the bottle, Rose Quartz looks less pink, but once on the nails they look identical. I actually can't tell the difference here! Except that maybe the Barry M looks to contain more glitter... great spot, thank you for sharing! they're actually so a like, looks lovely though! They look so similar! I will definitely be buying the Barry M over the OPI polish at ten pounds more expensive! I honestly couldn't tell the difference. They look identical to me. What a huge difference in the price tag. It looks really good over the black basecoat. This is a really good dupe. Ooh Pink on black - thanks for that I've got a good idea for Valentines mani now! Ooh Pink on Black - great idea for a Valentines mani!